We take the time to understand not only your business challenges and goals but also your user’s pain points and needs. Rooted in user research and data, we put together a strategic plan to carry out your vision and ensure a high return on your investment. We gather user feedback throughout the process to ensure we’re on the right track to success. Diagram (above) illustrates the phases of the process exercised at Collective Experience. Visit diagram description for accessibility. An investment in user experience, is an investment in a sound strategy. Providing value within a seamless experience is the key to not only happy users but also to achieving your business goals. Here are some ways a great user experience can impact your organization. Transparent approach to business – No hidden costs or agendas. We keep you informed every step of the way. Detailed estimate breakdowns – Know exactly what you’re getting, plus the options to scale the scope of work according to your budget. Flexible team size – Whether you need one designer or a small team, we scale our team to your project scope and budget. 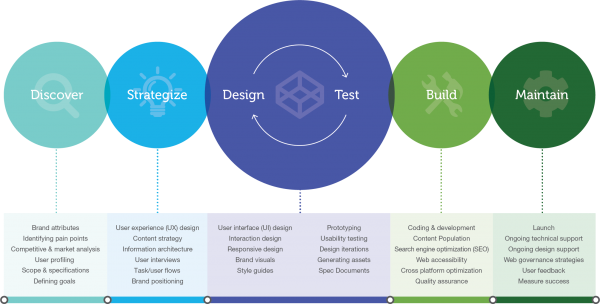 Realistic goals and expectations – A fine balance of optimizing user experience while also meeting stakeholder objectives and goals. With you all the way – Need branding or marketing materials to complete your project? We’re happy to lend a hand with whatever you might need.